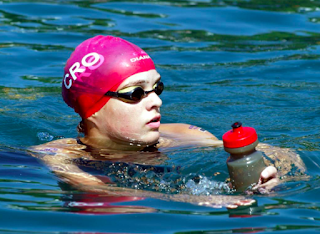 Dina Levačič is a Croatian professional open water swimmer and a 21-year-old student from Split. She trains under the Croatian Olympic open water swimming coach, Slaven Šitić, and just completed the Triple Crown of Open Water Swimming between June and September this summer. She started off with a 20 Bridges Manhattan Swim in New York in 7 hours 33 minutes on June 25th. Then she next completed a crossing of the Catalina Channel crossing in California on August 3rd in 9 hours 47 minutes. She became a Triple Crowner with an English Channel crossing on September 17th in 11 hours 42 minutes. At the age of 21, she has completed at least 25 marathon swims. She was the sixth youngest swimmer in history to complete the Triple Crown of Open Water Swimming [after 16-year-old Charlotte Samuels, 17-year-old Prabhat Koli, 18-year-old Lachlan Hinds, 19-year-old Benjamin Freeman, and 20-year-old Samantha Simon].